Chords are one of the brilliant things on the guitar that makes it so popular. Chords are pretty easy to get up and running, and with three or four of them, you are often on your way to playing any number of classic songs. 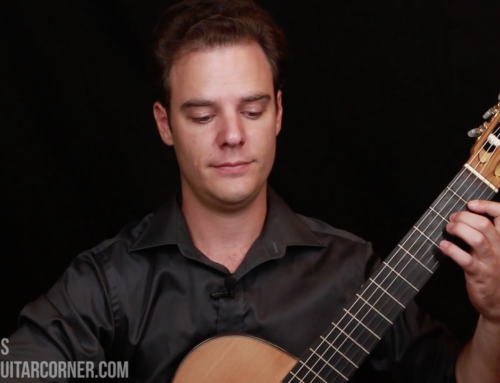 Chords are common in classical guitar music too, but they are a little disguised, so if you are not looking for them you might not even realize they’re there. Once you can see and hear chords being used in pieces you will find that instead of reading one note at a time, you can identify whole groups of notes, which you can then think of as individual harmonies, or chords. The first measure is C major, clear as day. In fact it is played with all the notes we would use for C major, and the bass note is C.
The second measure is a little more elusive. Starting on the note D it also has a G, B and F. What this is, is call an inversion. The chord is G7 which has the notes GBDF but it isn’t starting on the note G, rather the D.
A chord is in an inversion if the lowest note is something other that the root of the chord. This is a G major triad with a G in the bass. It is actually a D7 Chord, but it is missing the A. This measure is a little different in that it has two chords present. The first half of the measure is a C major chord, then the last half is D7. If you go through the whole piece now, you will start to see that it is infact, quite basic with its harmonies. Most measures have one chord per measure, and towards the end things get a little more complicated. Have a go at figuring out those chords, email me with the chord progression you come up with, and I will let you know how you went.